At Proludic we are committed to providing all children and young adults with exciting and innovative play and sport options. We realise how daunting the prospect of securing funding can be. That is why we would like to establish a partnership with you, giving our support and assistance at every stage of your project. 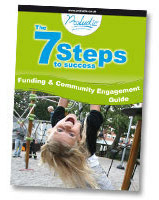 Our ‘7 Steps to Success guide’ provides useful advice and instructions to make your application for funding as smooth as possible. These come in a video or hard copy format. We will help you collect and compile consultation findings, meet you on-site to discuss options and provide you with a detailed design and quotation. Please also see our advice page here on the latest Sport England Towards and Active Nation Strategy and Funding which we can also provide assistance with. To order your copy of our ‘Funding & Community Engagement Guide’ please fill in our Registration Form below. You can then discuss your individual requirements with a Proludic Representative at a time convenient to you. Alternatively, please call us on 0115 982 3986 and we will be more than happy to help you.